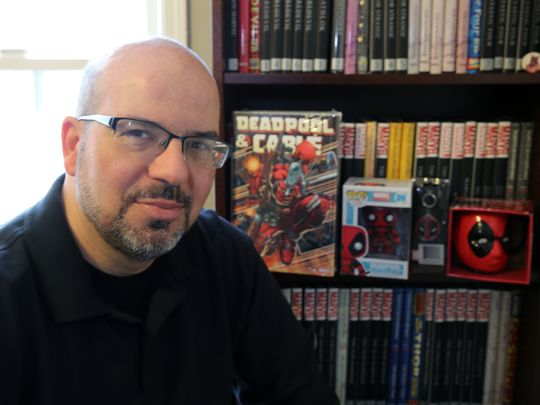 Deadpool co-creator Fabian Nicieza will be in Ontario for Comic Con Revolution the weekend of May 19 and 20, and will also have a Q & A session prior to a screening of Deadpool 2 at 10 a.m. Friday, May 18 at an unnamed Ontario theater. Not only that, a select group of 20 will not only get to see the movie, but will have the opportunity to attend a chimichanga lunch with Nicieza. $30: See the screening, get an autograph card, and a Comic Con Revolution enamel pin. $40: Same as the $30 ticket, plus a limited edition “Creating Deadpool” print and a chance to win a custom dialogue Deadpool print. $60: Same as the $40 ticket, plus a Comic Con Revolution logo T-shirt. $125: Same as the $60 ticket, plus the chimichanga lunch. What? You think that’s too much? You’ll be having lunch with a co-creator of Deadpool! That’s something you can’t put a price on. Well, OK, somebody did…and that price is $125. For details or to purchase tickets, click here. For more information, click here. This entry was posted in Mexican, Ontario by John Plessel. Bookmark the permalink.